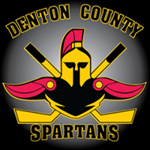 The Denton County Spartans Hockey Club is a non-profit, 501(c)(3) organization dedicated to the development of our high school hockey players through athletic and academic excellence. The mission of the Denton County Spartans and Board of Directors is to provide a highly competitive hockey program at the Varsity and Junior Varsity level for students currently attending school districts within Denton County. Competitive Ice hockey demands teamwork, commitment and self-discipline while emphasizing sportsmanship, skill development and community citizenship. We strive to challenge and inspire our players to reach for their full potential on and off the ice. The goal for our Junior Varsity Program is to play competitive hockey but more importantly, to offer players the opportunity to develop into the caliber of player that is prepared to earn a position to play on our Spartan’s Varsity hockey team. The focus for our JV players is to demonstrate the desire, tenacity and abilities necessary to advance to the Varsity level. We seek to create an enriching high school hockey experience for all our players and parents. As an organization, we are committed to our players development, our coaches success and to our community. Advocate USA Hockey's core values of sportsmanship, respect for individuals, integrity, the pursuit of excellence, enjoyment, loyalty and teamwork. Emphasize that honesty, integrity and fair play go hand in hand with developing playing skills, winning and having fun. Provide a fun, safe and rewarding experience for all participants, their high school or local hockey association, and their families. Provide the best practice and game facilities reasonably available to the league participants within their respective communities. Develop and promote positive relationships with all parties providing those facilities. Develop and maintain a positive reputation for the AT&T High School Hockey League by requiring all participants - players, coaches, parents and administrators - to exhibit sportsmanship and behavior that is beyond reproach at all times. ©2019 Denton County Spartans / SportsEngine. All Rights Reserved.